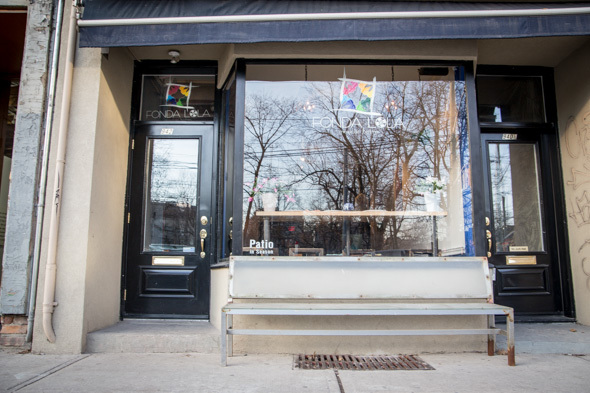 Fonda Lola opened last week on West Queen West, after gaining a cult following with pop-up appearances (including the world's largest tequila tasting, where they served up 1400 tacos in one night). From Owners Ernesto Rodriguez, AndrĂŠs MĂĄrquez (Milagro ) and chef Howard Dubrowsky ( L.A.B.) , the concept is traditional Mexican cuisine made from ethically and locally sourced ingredients. 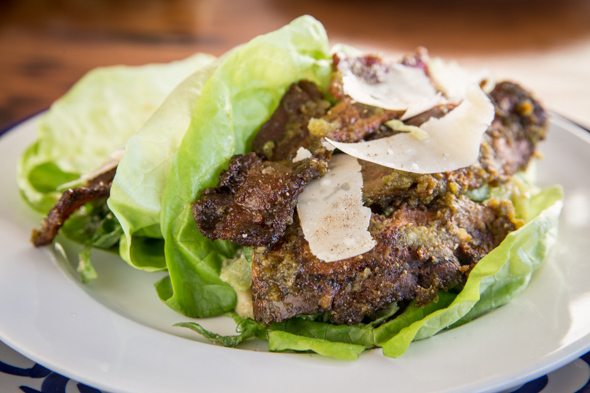 Dubrowsky is well known as one of Toronto's most veggie-friendly chefs, and much of the menu will appeal to herbivores. 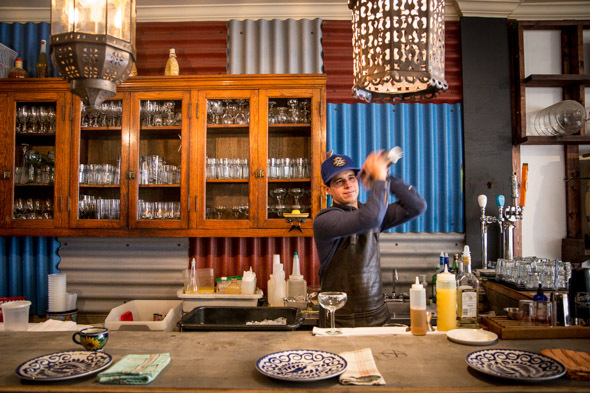 The aesthetic is rustic cantina, with some personal touches, including corrugated metal paneling behind the bar, hanging birdcages (featuring a variety of interesting things, such as fighting luchador figurines) and DIY banquettes made from old palettes. The blue and white dishware (hand drawn and imported from Mexico), as well as the thick-weave colourful napkins sit beautifully on the antique wooden table tops. 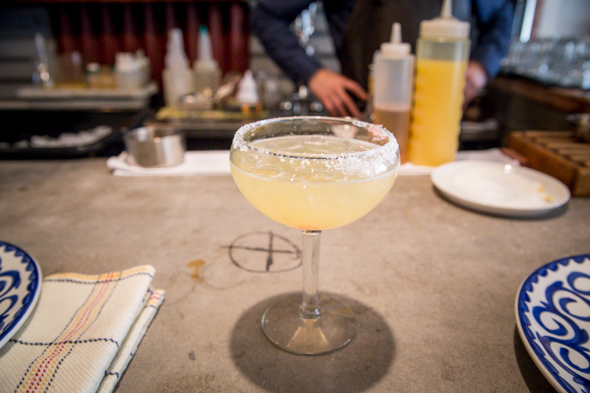 The bar program has taken on a healthy vibe, eschewing the ubiquitous simple syrup and agave nectar. In their absence, a mixture of maple water and maple syrup is used. It's locally sourced and not as calorie dense. Kombucha (fermented black tea), known for its many health benefits is used in the making of several cocktails and will also be available on tap. As a self-confessed margarita fanatic, I'm really impressed with Fonda Lola's take on my favourite drink ($10.50), which features a lemon salted rim, two ounces of tequila, maple water and a citrus blend of lemon, grapefruit, orange and lime juices, and garnished with a fingerling lime (when opened, they look like caviar, each little ball tasting like a lime wedge). I'm in love. The food menu is made up of classic dishes with a few fun twists. The hand held caesar ($8) is two bib lettuce wraps filled with a shredded citrus-dressed salad, a caesar avocado mousse, candied jalapeno bacon, topped with fresh shaved parmesan. It's one of the most inventive and delicious takes on the salad I've tried (including that trend of deconstructed caesar salads that were unavoidable just a few years ago). It's a great balance of sweet, salty and savoury with an added kick of heat for good measure. Trout Aguachile ($8) is the spicier relative of ceviche. Jalapeno, cilantro, garlic and cucumber are pureed and blended with lime juice to make a small soup-like base. 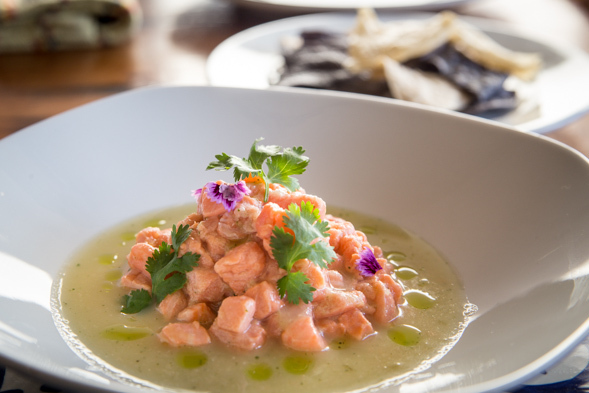 Fresh sustainable raw trout is served on top and dished up with a side of house-made tortilla chips. Every element of the flavours incorporated shine through wonderfully without any one overwhelming the other. Tacos al pastor ($10, lead photo), arrive at the table in elemental form. An array of dried chiles, adobo, pineapple and various spices including oregano and cinnamon are marinated in your pick of pork, beef or tofu, before being presented alongside a selection of toppings and condiments: roasted pineapple, cilantro, lime and tortilla shells. Assemble them how you like, and without the tortillas getting soggy and cold on the edges. 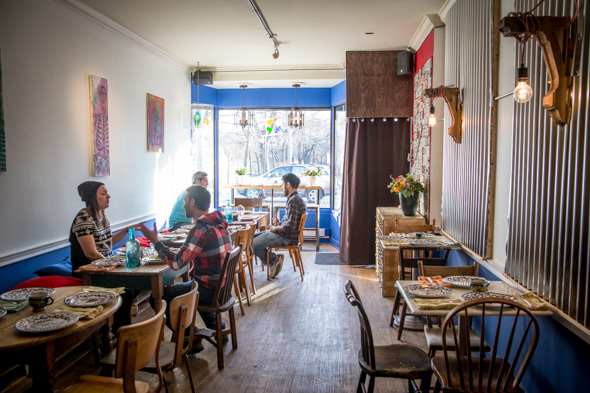 Fonda Lola is open from 6pm-late Tuesday - Saturday. With daily specials. The small spot fills up quick, although a heated back patio is in the works with another 26 seats.